Leather of the highest quality is the material that has the greatest longevity and durability for luggage. Because of that, and because it is completely natural and actually a by-product from the meat industry if you take care to choose the right leather, it is also a material that is environmentally﻿﻿ ﻿﻿sustainable. Leather luggage is equally suitable for the traveling nomad as for the strict business person. To us it exudes an air of sincerity, trustworthiness and relaxed confidence. Leather is classic and timeless and sometimes understated when compared to "modern" materials. But enough with the fluff! We have picked 5 great duffel bags of varying sizes and from different manufacturers. As always, read all the way through or jump directly to the bag that seems the most interesting to you. We also provide a comparison table for a quick overview. If we have left out a bag you think deserves to be mentioned with a review of its own, please let us know in the comments below. 24” W x 11” H x 13” D Medium: 5.8 lbs. Click here if you want to ﻿go to﻿ Amazon right away to check availability and discounts! We start with a travel bag from the import company Floto. They have been around since 2003, when the owner Joe Floto went to Florence. There he found his calling when visiting a family owned factory to have a bag made according to his wishes. Joe was enchanted with the athmosphere and the artisans work with the bags. He abandoned his career as an investment banker at Wall Street to start Floto Imports. Now he collaborates with that family factory and imports their products to the US. Fun fact: In the movie The Amazing Spider Man a bag from Floto plays the part of the long lost leather bag of Dr. Richard Parker. It's in a secret pocket in this bag that Peter finds the clues that sends him on a quest to find the truth to why his parents disappeared. 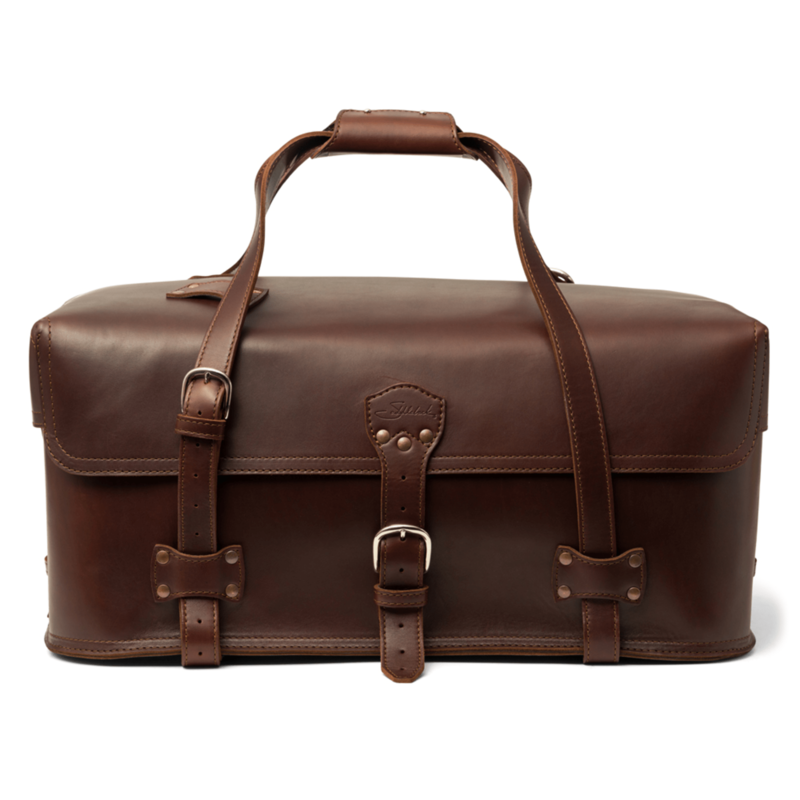 This leather duffel is made in Italy with Italian full grain calfskin (for leather qualities ​read this article​) that has been polished to a semi gloss finish to prevent stains. ​On the outside is a so called cargo pocket where you can put your passport and your cellphone. The nylon zipper goes all the way across the bag to create a large opening for easy packing. There are double top carry handles and a detachable and adjustable shoulder strap. On the bottom of the bag are five metal feet. Our notion is that the leather will still touch the surface you place the bag on, but less than without the feet of course. The lining is a nicely striped 100% cotton canvas. On the inside is one zippered pocket, otherwise it's an open packing space, the way duffels usually are made. The Monteverde bag comes in Black, Vecchio Brown, Olive (more like honey truth be told, see picture at top) and Tuscan Red. The warranty, called Limited Lifetime Guarantee, means that the product is covered for manufacturing defects for its "natural life". We are not quite sure how long that is supposed to be, but since Floto claims to "produce high quality leather bags for men and women" we reckon several years can be expected. So, what do users have to say about this stylish duffle bag? We promise that we have tried our best to locate some negative reviews, but we have failed miserably. All reviewers praise the bag for being "the perfect weekend bag", "gorgeous", "a great travel duffle bag" and more. The only really questioned feature on the bag is the "plastic" zipper, that is actually a so called nylon coil zipper. We are not sure that this is indeed a flaw. Nylon coil zippers are the zippers of choice for the luggage and outdoor industries﻿ because of the stronger horizontal strength. Our verdict then? If it fits your style, go buy. We have to admit something here. We have abandoned one of our main criteria when choosing a bag to review. No, it's not good quality or functionality​. We see no problems there. But, we cannot find a lot of reviews for this gem. Why? We don't know. The few reviews we have found are all (both, truth be told) 5 star ratings. Maybe this is not an every man's or woman's bag? We did look around for reviews of other bags made by American West though. Their all leather bags generally are getting very good ratings and reviews. The only really negative reviews we've found was about a strap coming off, and someone who had posted on several items that she/he didn't like fringes and the design reminded of the 70's, apparently the worst time for fashion. Oh well. We decided to include this gorgeous duffel despite of the above, because we simply fell head over heels in love with it. It combines best quality full grain leather and skilled craftmanship with amazingly beautiful design. The functionality of it is quite simple, as it should be with a duffle. One compartment that closes with a zipper. Interior is lined with AW signature cotton, and features one zippered pocket and two open pouches. you carry it with dual rolled handles or a removable and adjustable strap that drops between 22" and 26". That's it. Yes, we warmly recommend this bag. As far as we understand the quailty is topnotch. The guarantee/warranty covers for manufactural defects for as long as you own the bag. if you love the design as much as we do, there is no reason not to buy it. We truly believe it will make you happy! In a rush? Then click here to go directly to Amazon to check price and availability! In contrast to the duffel above this is a well reviewed one. And we would not have chosen it unless it was highly rated. Our aim is after all to introduce you with the best travel gear we can find on the web. Tuscany Leather claim to be a company that only sells highest quality products. They have indeed been successfull, and are now exporting to about 150 countries. Our question is of course, do the Praga duffel travel bag live up to this claim? The bag is made of polished calf-skin leather. There are three quite large exterior pockets, one on each side and one on the front. There is one compartment lined with a striped cotton fabric, and with one zippered pocket. All outside zippers are metallic, while the inside one is nylon. The main compartment can be locked using a padlock on the zipper pulls. There are double carry-handles, that are rolled to be gentle to your hands, and a detachable and adjustable leather shoulder strap. We are very happy with this bag! We like the three outside pockets, they make it easier to organise you stuff. From all the reviews we have seen, we are convinced that the quality of this bag is indeed high. Any drawbacks discovered then? Well, a couple of persons thought that the finish was too shiny, and one wanted it to be larger. Even though the main compartment can be locked, the three pockets can't, which made one user slightly discontented. But those are all the negative user experiences we could find. And whether they indeed are negative, well that's perhaps more of personal opinion. After all, there are no reports of broken zippers, no straps coming off, no ripped linings. Weight Carbon and Tobacco: 12.5 lbs. Weight Chestnut and Dark Coffee Brown: 11.9 lbs. If you are in a hurry, click here to check it out right away! Now this is a BIG travel duffel! Most certainly NOT a carry-on size, this one needs to be checked in. But the choice to include it here was easy, this is top of the line quality as far as leather luggage go. So what's the big deal then about this bag? Saddleback always use ​full grain leather for their products (read article on leather qualities here). The Beast is made from four biiig pieces of hide, to have as few seams as possible. There are no zippers or wheels that can break and leave you stranded. You can easily put it on a luggage cart, but it can also be carried as a backpack. There are no exterior pockets, but inside are two large open ones on each end. A really neat feature with the bag are the adjustable closing straps. You just pack the bag, and then you adjust the straps so the flap closes tight and snug. Watch the video below to see Dave Munson himself (founder and owner of Saddleback) present the Beast! Click here to ﻿read﻿ more about the Beast Duffel﻿﻿ and see all the colors at the Saddleback site! Oh, alright then, we can't refrain from letting you see this video too, featuring a much younger Dave. It's fun because it's filmed in Africa and besides Dave also features an African drum! ​As we said in the beginning, this is a huge bag. Really huge. But we love it because it is so simple and straightforward, and extremely practical if you can handle the size and weight. There are no negative reviews concerning the quality. The only 2-star rating there is at the moment closes the review with this: "Enjoy it, just understand this may not be an "everyday/every use" bag". So if you need a big bag that will stand by you til the end of time (almost), you have found it. CLICK HERE TO SHOP THE BEAST DUFFEL BAG NOW AT SADDLEBACK LEATHER! If you want to go the Saddlebck site right away you can do so here. The carry-on version is actually quite lightweight, something you would perhaps not expect from a full grain leather bag. One reason for this is probably because it has no pockets anywhere, inside or outside. This leaves a lot of space to pack in, and if you want to divide stuff a bit you can always use packing cubes. The bag body is made from only 2 pieces of leather, which makes it very durable since there are few seems that can fray. We love that there are so many ways to carry this duffle bag, just like the Beast above. You can carry it in your hand, cross body, over your shoulder or even as a backpack! Someone has done some serious thinking when designing this piece of leather luggage. The utility duffel is quite versatile in more ways than how to carry it. You can have a tall obect (umbrella perhaps?) sticking out at the side, and still close it tightly. The three buckle closure (one at each side and one front) allows you to overpack and still be able to have it securely closed. It's not a secret we love the products from Saddleback. (You can read a bit more about them here or here.) They are well designed in a no-nonsense way to make them durable and longlasting, yet beautiful. The materials are high quality, and the fact that there are no zippers or wheels means that there are few parts that can break and cause catastrophic situations at the airport. The real question here is: Do you fancy the style? If you do, you need not hesitate and wonder whether it's a good buy or not. It is. CLICK HERE TO SHOP THE UTILITY DUFFEL BAG NOW AT SADDLEBACK LEATHER! Curious about the difference between leather types? Click here and read all about it in our article!